Will a USB power cable constantly attached to my motorcycle battery draw power enough to kill my battery? Now-a-days I see a lot of accessories, especially for Royal Enfield riders which let them charge their mobile cell while they are riding. Seems fun and practical, virtually never letting your cell battery run out of juice. But does adding those extra load kill of the precious motorcycle battery instead ? Power cables by themselves don’t draw any power, however, a small 12V to USB converter will draw power and eventually discharge your battery. That is drain it, maybe not kill it. Kill is such a fickle word. I take “killing” a rechargeable battery to mean effectively ruining it so it won’t take or hold a charge anymore. The USB socket is 5V. Your cable converts the 12V vattery voltage to 5V and will consume power while it is connected. However, the amount of power is very small. You can measure it by testing the current drawn with an ordinary multimeter connected in series on a 12V wire. When there are no USB devices plugged in the power drawn will probably be so small that it will not be a problem if the motorcycle is in daily use. However, when a device (especially a GPS) is plugged in, the power consumption will increase. A cell phone probably will not run the motorcycle battery down too badly, but a GPS will. It is easy to forget to unplug a GPS and then the next morning the battery is so dead that it needs to be replaced. If you discover that your lead-acid battery has run flat overnight, it is very important to get some charge into it IMMEDIATELY. Sulphating begins as soon as the battery is flat and in a matter of hours there is measurable damage. A lead-acid battery shouldn't be allowed to discharge below about 30% if you want it to last. At least install an inline fuse in the 12V cable. When you store the motorcycle then remove the fuse or disconnect the battery. It is probably worthwhile installing a 4-port USB charger. You are likely to need power for more than one USB device. If you have a chain-driven motorcycle, maintaining your chain will become your most frequently performed task. You’ll probably need to adjust the tension of the chain, clean it, and lubricate it roughly twice a month (more often if you put a lot of miles on your bike). Although you may have to do it a lot, checking and adjusting the tension of your bike’s chain is easy. Here’s how you do it. To check the tension, grasp the lower run of the chain (not the upper one hidden by the chainguard) about halfway between the front and rear sprockets, and move the chain up and down. 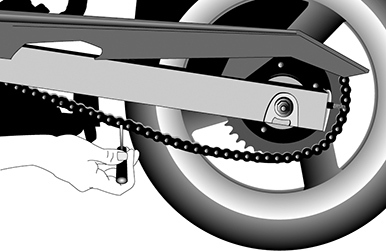 As they don’t wear evenly, check several spots on the chain by rolling the bike ahead and rechecking the tension. If the amount the chain moves varies from spot to spot, the chain may have a tight spot. If the chain moves up and down more than about an inch in the tightest spot, it needs to be tightened. If the movement is severe enough, you may need to replace the chain. Check the tension along the chain’s lower run, about halfway between the front and rear sprockets. Place the bike on the centerstand (rest it on its sidestand if you have no centerstand) and recheck the chain’s tension. Once on the centerstand, your chain’s tension may vary from when you first checked it because the bike’s weight is now off the suspension. Take this difference into account when adjusting the chain. If you adjust the chain to its proper tension on the centerstand, it may become too tight when off the centerstand, and a too-tight chain can break and shoot off your bike like a slinky missile. Loosen the axle nut (or nuts, if there is more than one). You will have to remove a security pin on most bikes when undoing the axle nut. Once the nut is loose, adjust the chain by adjusting some bolts on the very end of the swingarm, one on either side of the wheel. Usually, there will be two hex-heads on each bolt—an inner nut to move the axle, and an outer nut to lock the other in place when finished. 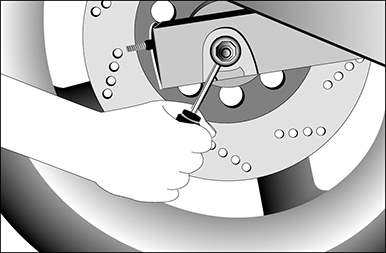 Loosen the outer nuts and then carefully adjust the inner nuts, moving the nuts on either side of the wheel an equal amount. Note: It is vital that you adjust the adjuster nut on the left as much as the nut on the right side; otherwise you’ll be making your back wheel sit completely wonky. When you have tightened your chain by the desired amount, tighten down the outside nuts. Retighten the axle nut, and insert a new security pin. Loosen but don’t remove the axle bolt. Make certain to adjust the bolts on each side of the wheel the exact same amount. Don’t overtighten the chain. The procedure for adjusting your chain varies from bike to bike, but most bikes use something similar to this method. Some bikes have a bolt on the back of the swingarm, with the locking nut between the bolt and the swingarm. A few bikes, especially modern sportbikes with single-sided swingarms, use an eccentric cam on the axle to adjust chain tension. See your owner’s manual for the procedure for adjusting these types of chains. To get the most use out of a chain, you’ll need to keep it clean and lubricated. Most bikes now use longer-lasting O-ring chains (chains with internal lubricant kept in place by tiny rubber seals), but these still need surface lubrication. The problem with O-ring chains is that many substances degrade rubber O-rings, including common lubricants and cleaning solvents. Use only cleaners and lubricants approved for use on O-ring chains. Place an O-ring-approved cleaner on a soft brush and clean the grime off the chain. When you’ve got all the crud off, wipe the chain dry before applying fresh lubricant. To lubricate your chain, aim the spray from the can of lubricant at the inside of the chain while rotating the wheel to evenly coat the chain’s entire length. Like all motorcycle maintenance, this is infinitely easier if you have a centerstand. As lubricant and tires don’t make a good combination (you could lube yourself right off the back of your bike) it’s wise to protect the back tire while you spray on the chain lube. Holding a newspaper between the chain and the tire works fine. You might clean your chain every few rides, but you should be lubricating it after every single ride. It’s best to lube it after a ride, not before, because after a ride the chain is nice and hot, meaning the lube will penetrate into the links more deeply. Motorcycle drive chains last much longer than they did just a few years ago, but they also cost a lot more than they used to. And they still wear out. With good chain adjustment and lubrication, you can go through two chains before your sprockets needed replacement. That’s a good incentive to look after your chain! You can also minimize wear on your chain by not beating on your bike. The harder you accelerate, the more you stretch your chain. Now that you’ve got your bike’s chain adjusted, it’s time to get back out on the road! Happy motoring! How to patch a tubeless motorcycle tire ??? Flat tire in a car? You're back on the road in fifteen minutes. Flat tire on a motorcycle? You need to have a plan. I used this generic string-type tubeless tire repair kit after noticing that my rear tire was losing a few PSI per week. Here's how you can too. The kit consists of a rasp, a needle tool, five sticky strings, and some rubber cement. The only thing it's missing is a pair of pliers to help remove the foreign object from the tire. It's always a good idea to carry a good multi-tool too. I pulled the 3 millimeter-thick nail out of the tire. Hiss! It took a great deal of force and twisting to get the 6 millimeter-thick rasp into the rapidly deflating tire. In fact, it felt like a very bad idea'if the repair didn't work, the tire would be ruined and I'd have to call a tow truck. After cleaning rubber particles from the enlarged hole with a glob of rubber cement and the needle tool, it was time to insert the repair string. The string is a sticky, 4' long rope about as thick as a pencil. It threads through the needle tool, which is forced into the tire until only one third of the string remains visible. The needle tool is yanked straight out of the tire and the excess string is cut off nearly flush with the tire. The needle tool is split at the tip like a pinched fork, which allows it to be removed from the tire without pulling the string out as well. After one month and 608 miles of two-up riding and highway speeds, the plug still looks great. The tire has lost about 1 PSI. I'd have no issues riding on it until the tire wore out, and a quick look around on forums shows that many riders with plugged tires do just that. I've heard that Germany doesn't allow plugged tires. I've also heard that a repaired tire loses one speed-rating. That means this Z-Rated tire would become a V-Rated tire, with a top speed of 149 mph. That seems absurdly high. Safety also depends on the position of the patch, if the tire has steel belts, who does the work, and the way the tire is constructed. I advise against patching any tire without first contacting the manufacturer. If there is any doubt, replace the tire. Tips on riding in the Cold Weather !!! This is a good topic. But explaining this would take much of space here. So I am posting the link for the tips on riding in the Cold weather. Hopefully after reading the tips, you can enjoy Riding in the cold. How to check if the tax has been paid for the current fiscal year of the motorcycle ??? You can check online if you want to see if the motorcycle's tax has been cleared or not for the fiscal year. Here are the URLs to check. How to wash a motorcycle ??? If you want motorcycle cleaning tips that will help you clean your motorcycle faster, easier, and without damaging it, here are some tips to help you. » Some soft, clean cloths. You'll need some for washing and some that you keep dry for drying and polishing. A dirty rag can scratch the bike. There are "wash mits" you can purchase and use, but only if they are kept clean. » Clean sponges - a dirty sponge can contain dirt which can scratch paint and chrome. » Cleaning solution made specifically for motorcycles. Because the cleaners will get on the paint, saddle and chrome, use products that are not going to cause problems with discoloring the finish or "blue" the chrome. When it comes to motorcycle cleaning, many bikers make a mistake of using the wrong motorcycle cleaning products, which can damage your motorcycle. » You may want a bucket for mixing solutions. Follow the mixing directions on any supplies. Be sure each product is used properly. » Of course, you need a water hose as well. Now that the bike has cooled to the touch, you can begin the wash. Using the motorcycle cleaning product recommended by our motorcycle manufacturer, mixed properly following label instruction, prepare your cleaning solution. If you have heavy dirt or have bugs on the fenders, hose down those areas gently from top to bottom first. This will allow them a kind of "pre-soak" to loosen them. Then hose once again to rinse off any debris that has loosened. Beginning from the top to the bottom, wash gently, using a clean soft cloth or a wash mitt. If your cleaning cloth becomes soiled, do not take the chance of scratching the paint or chrome; change to a clean cloth. If you use a sponge, be absolutely certain no debris gathers in the sponge pores and causes scratches. Use a wheel cleaner and soft rag to completely and thoroughly clean each wheel. When drying, look for spots that water tends to pool and take an extra bit of care to be sure those areas dry thoroughly. Maintain your leather with the products your motorcycle maker recommends. Treat the saddle, and any leather accessories.